U.S. weighs military options against N/Korea – Royal Times of Nigeria. The U.S. military is ready to provide options to President Donald Trump over the continued launch of ballistic missiles by North Korea, Secretary of Defence Jim Mattis said. Mattis, in a statement by the U.S. Department of Defence, however, said diplomatic and economic efforts remained the tools of choice to convince North Korea to stop its nuclear and missile programmes. “The President and Secretary of State, Rex Tillerson, have been very clear that we are leading with diplomatic and economic efforts. “The military remains ready in accordance with our alliance with Japan, with Korea,’’ Mattis said during a news conference at the Pentagon. “The North Korean launch of an intercontinental ballistic missile on July 4 is a very serious escalation and provocation and also an affront to the United Nations Security Council resolutions,’’ he said. The defence secretary stressed that the effort against North Korea was purely diplomatically led, adding the weapons of choice are economic sanctions. He, however, added that these would be buttressed by military capabilities. Secretary of State Rex Tillerson is the administration points man with regard to North Korea. “We stand ready to provide options if they are necessary,’’ Mattis said, pointing out that diplomacy with regards to North Korea had not failed. 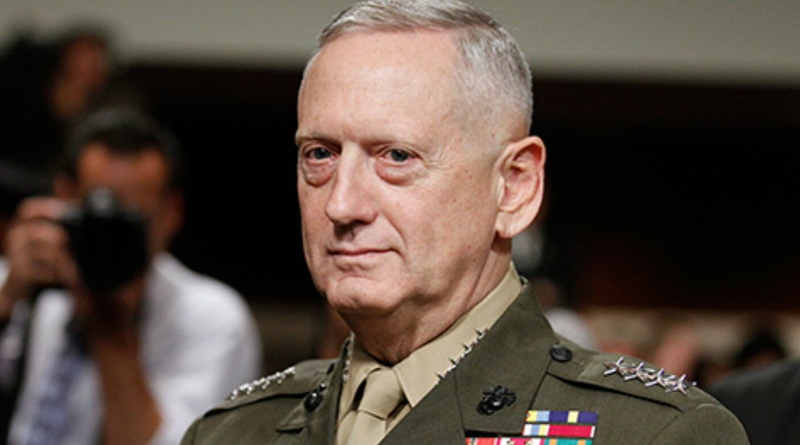 Mattis quoted Gen. Vincent Brooks, the Commander of U.S. Forces in Korea, saying America and South Korea have exercised extreme self-restraint in avoiding war. He noted the shelling of South Korea’s Yeonpyeong Island in 2010, the sinking of a South Korean ship earlier that year and other provocations at sea, on land and in cyberspace. “Our self-restraint holds, and diplomatic efforts remain underway as we speak,’’ he said. The U.S. is working with allies to influence North Korea, while U.S. officials are also working with China – North Korea’s benefactor and the largest trading partner to place more pressure on North Korean leaders to stop the nuclear and missile programmes.